Tires screech as a car full of teenage boys swings around to get a closer look, barely decipherable bellowed comments ringing across the parking lot. I clutch my small bag of groceries a little more tightly, willing myself to maintain a blank face and an even pace, wishing for the first time in a number of years that I didn't enjoy parking far away from the store entrance so I could get in a bit of a walk. My stomach clenches with the familiar tension, and I wait for the usual relaxation. It doesn't come. And suddenly I know why. It had been many years since I had been mistaken for a woman and subjected to random drive-by harassment. The last time it happened, I had been reasonably confident that once they realized I wasn't female, they would drive off, perhaps getting in one last parting shot, and leave me alone to think on the notion that actual women don't have that comforting expectation. This time, however, I had a new awareness of both the numbers of transgender people and the constant danger they are in. If these kids were to decide that their having mistaken me for a woman meant I had crossed some gender line and deserved to be beaten up or worse, there wasn't going to be much I could do about it. The whole incident didn't last more than half a minute but has stuck with me. No group of people is at more risk for being subjected to hate crimes and violence than transgender people, as the litany of a spreadsheet on the Transgender Day of Remembrance website attests: Strangled. Shot and dragged. Stoned, beaten and burned. Stabbed. Shot to death by her brother. Shot. Shot. Shot... For many years, I have had something of a sense of what it's like to be a woman and subjected to drive-by harassment. Now I have also something of a sense of what it's like to be transgender and live with the awareness that at any moment, without warning, life as you know it could end. The other day, one of my Humanities 7 students did a brilliant presentation on the blink effect. In the time it takes to blink, she told us, you form your first impression of people and make your first judgment. Very often, students and classes wrestling with this concept will use the information to affirm the need to be aware of the blink effect and work hard to get past that moment and genuinely get to know people as they really are. This student took it one level deeper. She had found a plastic surgeon's site that attempted to convince people that the best way to combat the blink effect was to do everything possible to ensure that your own personal body and face led to positive judgments the split second people meet you. She was, quite properly, outraged. The best way to combat the blink effect, she stated, was to stop caring what other people think of how you look and just feel good the way you are. The class was completely in agreement. Yet, as I make that statement, and even though I believe deeply in its truth, I have the uncomfortable sense that it's still not enough. Far too many voices have been permanently silenced simply because of who those people are and the snap judgments people have made about them - and not just transgender people, of course. Far too many additional voices are effectively silenced as people hide their true selves. And we are living in times when legislation has actually been proposed permitting harassing, hateful speech as long as the speaker can claim a religious basis to their statements. I know there are people whose religious beliefs are that LGBT people will not go to heaven, and of course I accept and even support their right to those beliefs. But I cannot support that (fortunately much smaller) subset of people who use religion as an excuse to deny people their fundamental human right to respect. All that being said, we are also living in times when gay marriage has become acceptable to the majority of Americans, where the visibility of transgender people is on the rise, where gay people (if not yet transgender people) can both serve their country and be open about who they are. And we are living in times when young people are growing up more aware than ever of the rich diversity of people around them, more inclined to respect that diversity, and more inclined to affirm themselves in the face of those who are less respectful. 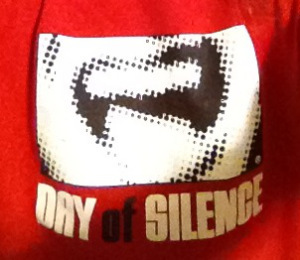 So on this year's Day of Silence, I give thanks for progress being made and for my students' part in that progress, and I recommit to working toward a day when the Day of Silence is no longer needed and only exists in history books.